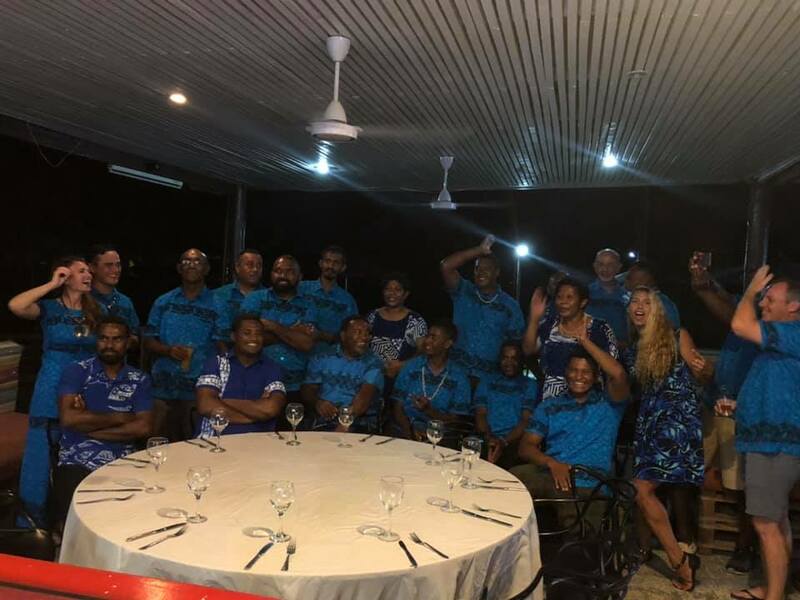 Beqa Adventure Divers, known as BAD, is celebrating it's 15th anniversary. We want to congratulate BAD for being one of the most awesome dive companies in the world. Their moto, "We are a conservation group, masquerading as a dive shop" is more than a mere slogan. What they have accomplished in their 15 year history is simply amazing. If you ever heard of what Valerie Taylor called the best shark dive in the world, she was referring to the dive at the Shark Reef Marine Reserve, operated by none other than BAD. And speaking of the Shark Reef Marine Reserve, it was created by BAD in 2004. Initial fish counts at the reef showed about 280 different species of fish, which is very bad for the south pacific. After 10 years of protecting the reef, the number of species increased to 480! As of November, 2014, Shark Reef Marine Reserve has been designated Fiji’s first National Marine Park and BAD was being entrusted with its day-to-day management. To my knowledge, this is the first national park in the world that was created due to the efforts of a single private entitiy. But creating a national park is not all that BAD has accomplished. They also partnered with Projects Abroad to create Mangroves for Fiji, a project designed to combat global warming and now their latest, My Fijishark a shark adoption program benefitting protection and conservation of the sharks in Fiji. Congratulations to BAD for being the best conservation shark diving operation! Keep up the good work! The BAD boys and girls, celebrating! 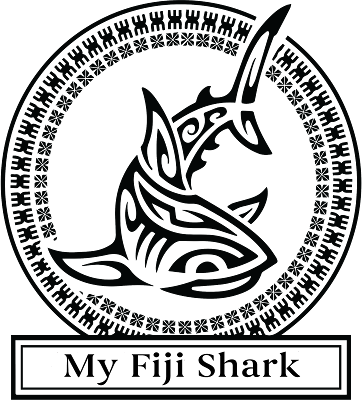 Shark Diver is proud to be using BAD for our Bull Shark diving expeditions to Fiji. 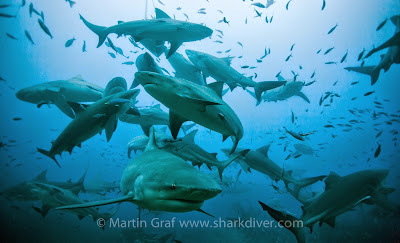 We are heading there in May, and we can book a Bull Shark dive for you anytime of the year. For more information on our Bull Shark diving adventures, call us at 619.887.4275 or email crew@sharkdiver.com for more information. Chugey is one of the iconic sharks at Guadalupe. We first encountered him in 2004 and he's been regularly sighted ever since. One of his characteristics is his cut caudal (tail) fin. It pretty much resembles the tail of an airplane, with a flat top. Chugey is a very active shark, to say the least. Being cautious doesn't seem to factor into his actions. He's had numerous injuries throughout the years, but seems to be just fine despite of it. Just how rough a life does he have? 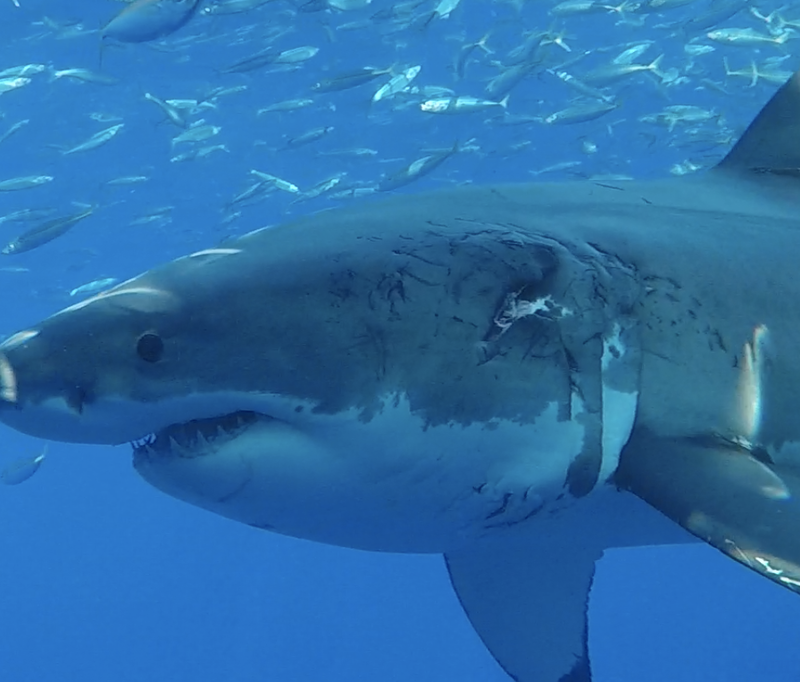 We have talked about the amazing healing power of these amazing Great White Sharks here and it looks like they really need that ability to heal. Chugey, the shark we were talking about in that blog, was back at Guadalupe Island and it looks like that he hasn't gotten any more careful since he got his face bit the first time. While his original wound closed quite nicely, he was sporting some brand new bite marks. As a reminder, here is what he looked like 2 years earlier. Here is what he looked like with his old scar and new bite marks. This is another picture of Chugey, taken by one of our divers, Marie Tartar. It's great to see him back at Guadalupe acting like nothing happened. I continue to be blown away by both their ability to heal and never showing any signs of discomfort or indication that they are in pain, when swimming around with severe bite injuries. 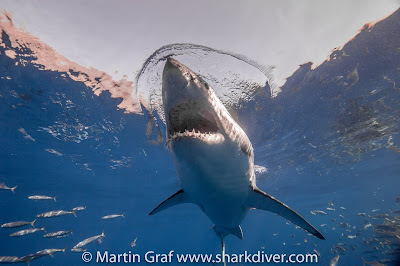 This fall we are heading back to Guadalupe Island for our 19th season of diving with our Great White Sharks. Nicole Nasby-Lucas, who is the person responsible for our photo ID database, will be coming out with us on 4 of our expeditions. Thanks to her database, we can individually identify the sharks and also have a history of when they visited Guadalupe Island. In 2018 we added over 30 new sharks and are now over 300 individuals that have been sighted, since we first started diving there in 2001. How many new sharks will we encounter this season? I can't wait to get back there and find out. What will he be named? If you would like to come out with us, we only have a few spaces open for this season. We are also booking for the next 2 season and some expeditions are almost sold out. Don't miss your chance for an amazing trip of a lifetime. Call 619.887.4275 or email us at staff@sharkdiver.com for more information or to reserve your space. About Shark Diver. As a global leader in commercial shark diving and conservation initiatives Shark Diver has spent the past decade engaged for sharks around the world. Our blog highlights all aspects of both of these dynamic and shifting worlds. 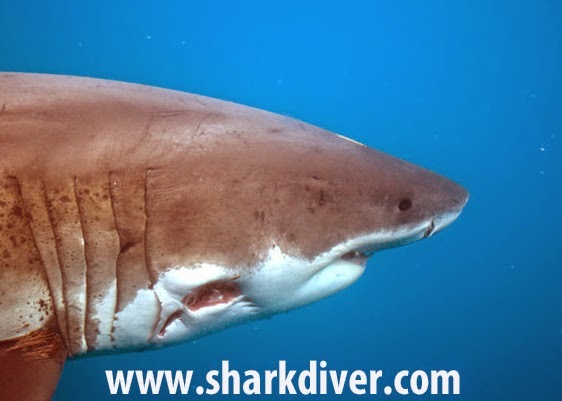 You can reach us directly at crew@sharkdiver.com. I love "Lucy", and I'm not referring to the popular TV show of the 50ies. 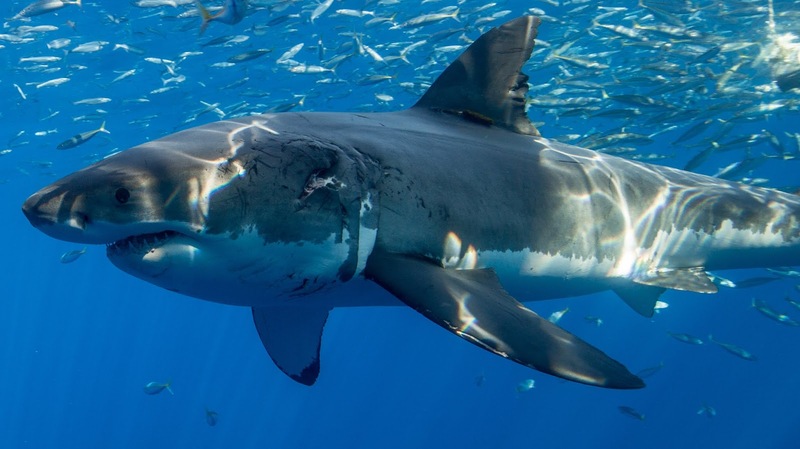 "Lucy" is a large female Great White Shark, that is regularly visiting Guadalupe Island. Most mature females are only seen every other year. They mate at Guadalupe Island and then stay away from the Island until after they give birth off the coast of Baja and in the Sea of Cortes, about 18 months after they get pregnant at Guadalupe. 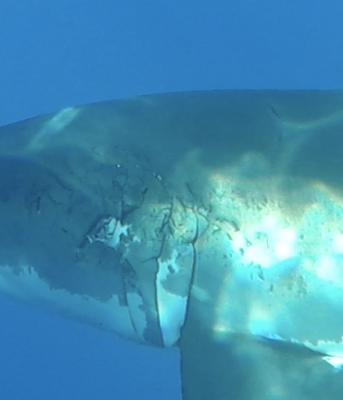 In 2008 she suffered and injury to her tail, most likely from a bite by another shark. Her tail is pretty much mangled and it probably affects her speed. Even though she is definitely a mature female, we saw her every year until 2014, which meant that she didn't get pregnant, since pregnant females stay away from Guadalupe for a season and return every other year. I don't know if the mangled tail was the reason she didn't seem to get pregnant for all those years, but fortunately she has started showing up every other year since then. Hopefully this means that she is indeed getting pregnant now. We last saw her in 2018, so most likely we won't see her again until 2020. "Lucy's" tail makes it very easy to identify her. Usually we identify the individual sharks by their coloration. The transition from the white underbelly to the grey top is unique for every individual. Some people try to identify the sharks by their scars. That is how "Bite Face" got his name. The problem with scars is that they heal and if that is the only identifying characteristic you have, you would not recognize that same shark when it comes back the following year. Mutilations, like Lucy's tail don't change and can be used in conjunction with the markings to identify her. We have a photo id database that is managed by Nicole Nasby-Lucas from the Marince Conservation Science Institute, with over 220 individual sharks in identified. If you are coming out on one of our "science" expeditions, you'll get a chance to learn how to identify these sharks from Nicole herself. You will also get the complete photo ID database, so you can identify all the sharks you encountered and what's really cool, you will then be able to identify the sharks you see on TV. How awesome will it be, when you see a shark on TV and realize that this is the individual that swam inches from your face at Guadalupe? Even with her tail slowing her down, she seems to be healthy in every other way. She is definitely getting enough food and is holding her own among all the sharks at the Island. 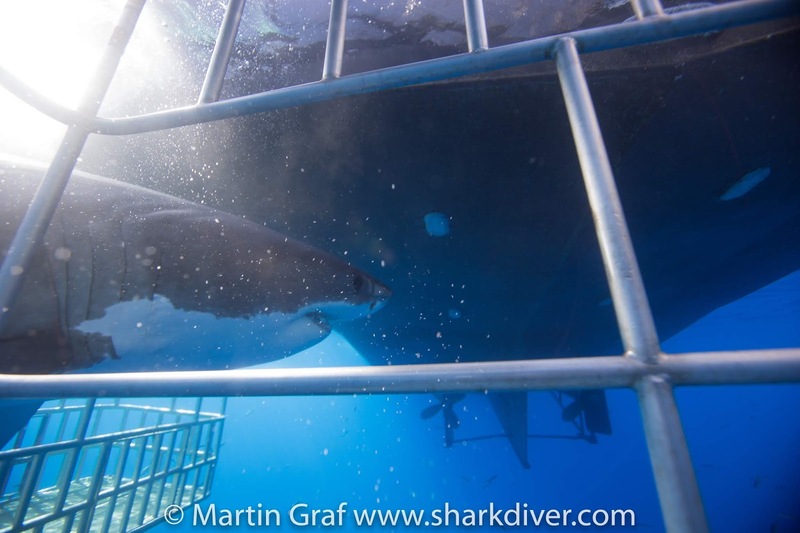 Lucy is a very curious shark and she swims very close to the cages, making eye contact with our divers as she is gliding by slowly. I hope to see Lucy when we return in the fall. I do have mixed emotions though. While I would love to see her, it would of course mean that she didn't get pregnant last season. "Scarboard" is another one of my favorite sharks. You're probably beginning to see a pattern here. I have a lot of "favorite" sharks. It's is amazing how all these sharks have different behaviors. Some are a bit skiddish, others are seemingly relaxed without a care in the world. Observing them for 16 years, I have grown attached to these guys and girls. However, as I always point out, I absolutely love these sharks, I'm crazy about them, but it is NOT a mutual feeling. As much as some people want you to believe that they just want to be hugged, they really don't. They are awesome predators, not out to get us, but they are not harmless pets either. 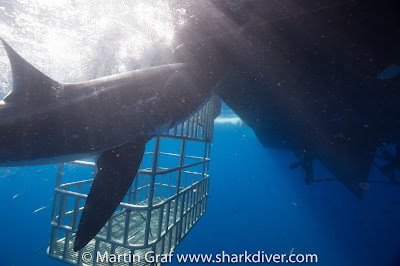 Scarboard is a massive female shark, one of our biggest at Guadalupe Island at around 19'. When we first met her in 2002, she was already huge. Like most of our adult females, she shows up at Guadalupe Island every other year. After getting mating at Guadalupe, she is spending the year in between offshore, before giving birth off the coast of Baja or in the Sea of Cortez. She doesn't have any mutilations, like "Lucy" and so many others, but she does have a very unique characteristic that makes identifying her easy. She has a very distinct line from her nose halfway to her dorsal fin. 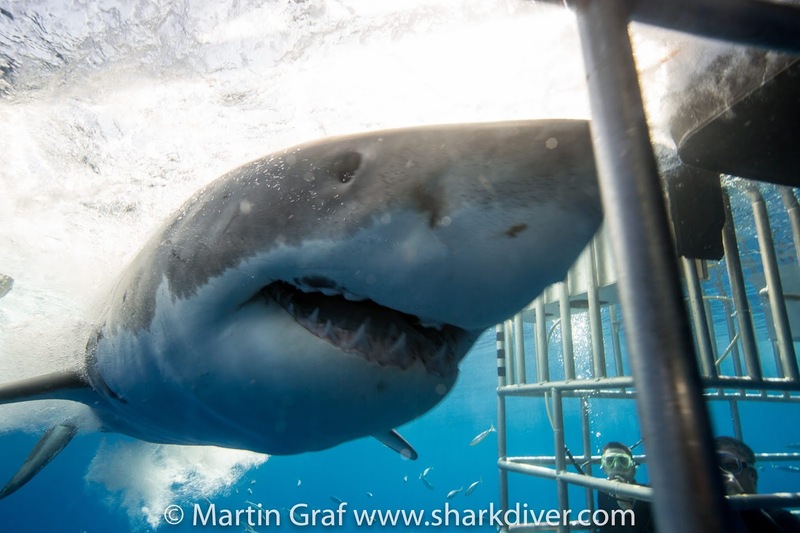 Where most Great White Sharks' lines have a continuous curve, Scarboard's is straight. After we first encountered her in 2002, she came back in 04 and 06, but then we didn't see her again until 2011. We don't know, if we simply didn't see her, or if she stayed away from Guadalupe for 5 years. When we don't see a shark during the season we expect to see them, we always worry that something might have happened to them. Luckily, sometimes, like in Scarboard's case, we worry about nothing. Where do they go during that extended time away from the Island, what do they do? There is so much we don't know about those sharks. 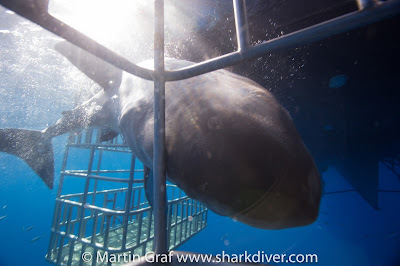 The first time we saw Scarboard, after her 5 year absence, I was in the middle of our 2 cages, she slowly swam by the first cage, checking out each individual diver and when she came to me, she looked me straight into the eyes, stopped and did a 180 degree turn, looked at me again, swam off, turned and swam back at me, stopped again, turned and swam off. It looks like that she recognized me, even after a 5 year absence. 2 seasons ago, "Scarboard" was being used for protection by some bait fish. I've never seen anything like that before. When she swam by, she looked like the "Bearded Lady". A lot of people are surprised to learn that Great White Sharks recognize individual divers. The fact that they do is not as strange as it seems. We know of lots of fish that recognize divers. Groupers that have a favorite individual they follow around, moray eels that come out of their holes when they recognize a diver, Wolf eels that wrap themselves around the neck of an individual etc. It's important to remember though, just because White Sharks recognize individual divers, doesn't mean that they "love" us, want to be petted, or have any feelings towards us. We need to respect them for what they are, amazing predators, neither mindless killers, nor harmless pets. For me there is nothing quite like seeing a familiar shark and realize it recognizes me as well. It still amazes me that we keep seeing the same individuals on a regular basis. They migrate thousands of miles, but come right back to the same spot. If you want to find our for yourself what it's like to come face to face with a great white shark and want to learn how to identify these sharks, join us on one of our "science" expeditions. We do have some spaces open and would love to introduce you to our sharks. 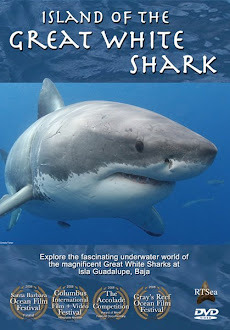 Call 619.887.4275, email crew@sharkdiver.com or visit www.sharkdiver.com for more information. 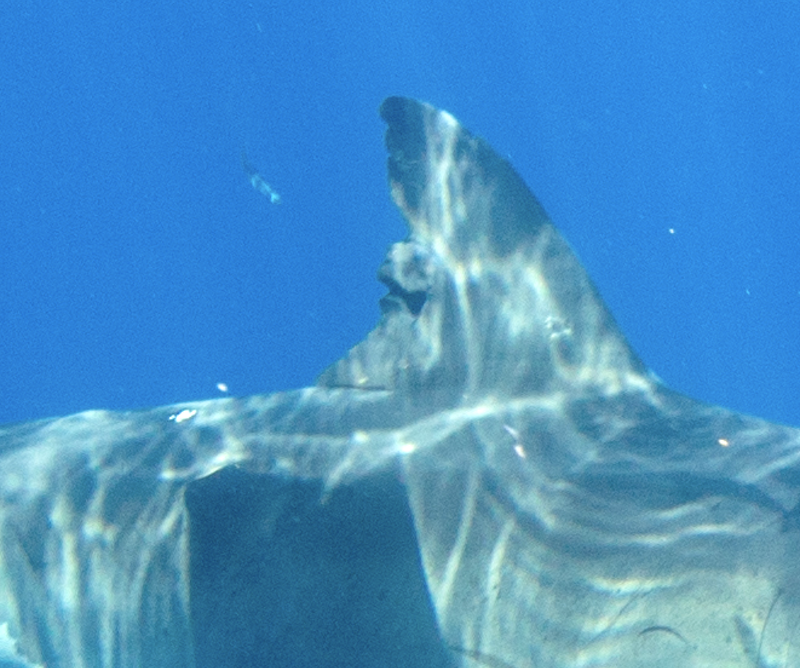 Meet "Tryss" one of our Great White Sharks at Guadalupe. The 2018 season at Guadalupe Island has been phenomenal. Thanks to Nicole Lucas from the Marine Conservation Science Institute, we have a way to identify and keep a record of all the sharks seen at Guadalupe Island. This is how we know that on one of our expedition we encountered a record breaking 52 different individuals, including a whopping 16 sharks that have not been previously identified. This shattered our previous record of 34 individuals seen on a single trip. It's not just the number of sharks we encountered that was unusual, it was also the behavior of one of the new sharks. Meet "Tryss", or crazy Tryss as I like to call her! Tryss displayed a very unusual behavior for a Great White Shark. 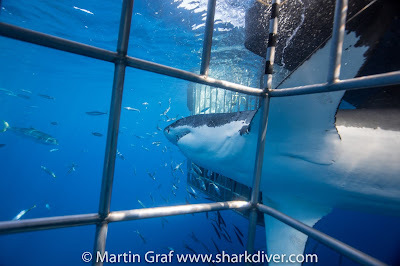 She came to the cages multiple times, without any bait attracting her, sticking her nose into it, bumping the boat and squeezing through narrow gaps. 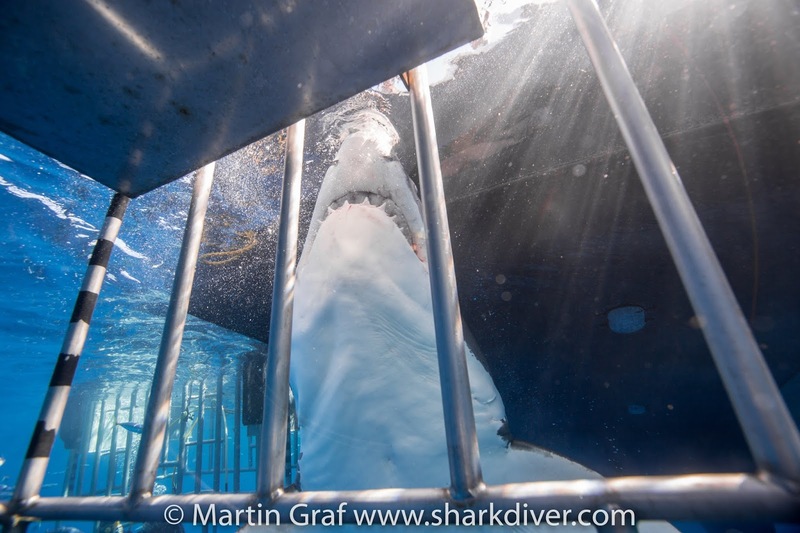 She did all that in slow motion, never freaking out like other sharks would, when they touch the cage, keeping her eyes open, totally aware of her surroundings. Check out the pictures and videos of her. "Tryss" coming between the cages and the boat. "Tryss" sticking her nose into the cage. Sticking her nose into the cage. In 18 years of diving with these amazing animals, I have never witnessed a shark behave quite like this. It just goes to show that they will never stop surprising you. That's why I love my job and am completely fascinated by these awesome creatures. Shark Diver proudly supports the Marine Conservation Science Institute through our MCSI hosted expeditions. Joining us on one of these expeditions is a great way to learn about our sharks and support the research. Maybe you'll even get to name a shark, like the ones who named "Tryss" last season. The world is full of celebrities, but how often do you actually get to meet them and spend some quality time with them? Over the past 18 years, I've been privileged to do just that. I've met many stars of film and TV at Guadalupe Island. Stars like the incomparable "Shredder" "Bruce" "Jaques" "Lucy" "Scarboard" etc. All of those sharks have been featured in countless shark week episodes and their pictures are all over the internet. They truly are the rock-stars of Guadalupe Island. I want to introduce you to a few of these Rock-stars, before our season begins in August. Bruce saying hello to Whitney, one of our divers! Bruce is also the shark who got me interested in shark research. I have to admit, that reading scientific papers held about as much excitement to me as watching grass grow. It simply wasn't my thing. When Dr. Domeier tagged Bruce with a satellite transmitter and used some of the data it produced for his paper on white shark migration, Nicole Nasby-Lucas, who works with Dr. Domeier and is responsible for the Guadalupe photo ID database, gave me a copy of the research paper. I started reading it, and realized that this paper was not just a research paper, but more like Bruce's travel journal. It was exciting to find out where he was going, when not at Guadalupe and what he was doing. Who knew that he was vacationing near Hawaii?! I mean, who wouldn't want to vacation there? 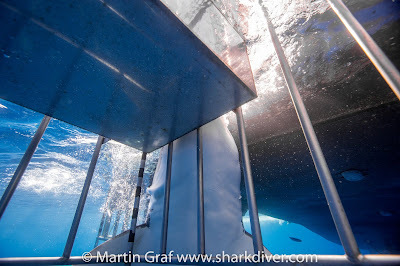 Did you know that Great White Sharks can go deeper than 3000'? Well, I didn't, until I read that paper. 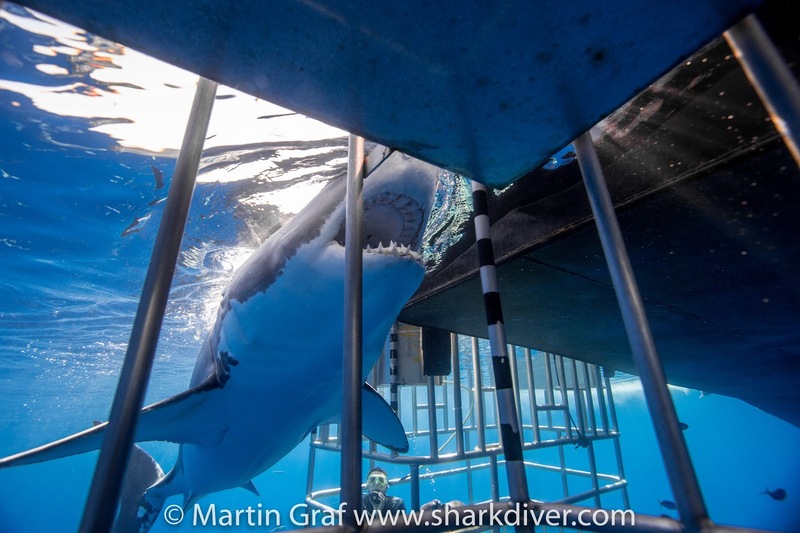 Even though he is one of the more mellow sharks around, being a great white shark and male, Bruce was not averse to a little fighting here and there. I remember one particular morning. I was just getting into the cages to sort out all the regulators, when I noticed some movement behind me. I turned and saw Bruce who looked me straight into the eyes. He sported a huge bite injury, just in front of his gills, with a hole that let me look straight through it and out his mouth. The amazing thing was, it didn't seem to bother him. He just kept swimming around and stayed active, like nothing had happened. Bruce about a week after the bite. Just like Chugey, when he came back the following year, his wound was closed and there was barely a scar to indicate that he was ever injured. Bruce with his closed bite injury. Since we started shark diving at Guadalupe Island, we have met over 300 different individual sharks. Who is going to be back this year? Who is going to make their first appearance? Come join us and find out! This is your chance to meet these celebrities up close and personal. They do pose for pictures with you! Next time you watch shark week, you can say, "Hey, I know that guy!" We run our trips from August through November and have a few spaces left for this coming season. We even have a couple of spaces open on our research trip on November 4. On that trip you'll get to meet the researcher who knows all about those sharks, Nicole Nasby-Lucas, along with all the rock-star white sharks of Guadalupe Island. Call us at 619.887.4275 or email crew@sharkdiver.com for more information. Is shark diving good for conservation? Conservation and Shark Diving are often seen as opposites and not compatible. Let's look at some of the concerns raised and see how valid they are. The biggest issue a lot of people have with shark diving and specifically feeding dives is that "It conditions sharks to associate people and divers with food!" While it does indeed condition sharks to associate divers with food, it definitely doesn't condition those sharks to associate divers AS food. The sharks at the Shark Reef Marine Reserve are being fed 5 days a week and I dove on a non feeding day. I got to about 45 ft when a few Bull Sharks sharks approached me, clearly looking for food. After they swam around me for a little bit, they realized that I didn't bring any food and they left. At no point did they show any indication that they looked at me as food or made any attempt to bite me. I actually think that being around divers at feeding sites makes the sharks less likely to attack. If I would be approached by a bunch of Bull Sharks at a non feeding site, I would be a lot more concerned, since it is unusual for them to approach divers without being attracted by some kind of food or chum source. Another argument against feeding sharks is that it alters their feeding and migration behavior. Since I'm not a scientist that has studied this issue, my experience comes from observing and diving with sharks, I defer to those who actually studied this issue. There are a few good papers out that are addressing this. Essentially they are saying that it has no real impact on their migration and hunting behavior. Click on the links above for more detailed information. OK, so shark feeding is not as bad as people think, but is it actually good for conservation? While there are certainly some outfits that don't have conservation in mind when they do their shark dives, there are also responsible operators who care deeply about conservation and who have accomplished some amazing things. We all know about the problem associated with the overfishing of sharks. If we want to protect sharks, we have to find a way for the shark fishermen to make a living doing something else.When we argue that a life sharks is worth hundreds of times the amount of a dead shark, we have to make sure that a life shark is worth more to the fishermen as well and not just to the tourism industry. This is what Beqa Adventure Divers (BAD) has accomplished in Fiji. They got a fishing village to agree to not fish on a reef in exchange for a fee paid by all the divers. "They also hired people from fishing villages and trained them to be Divemasters, Instructors and Boat Captains. When they started diving at that reef, an initial fish count netted about 280 different species of fish, which for the south pacific is very dismal. Ten years later, another fish count showed over 480 different species. The number of sharks seen at the feeds also increased from a handful to sometimes over 100. The efforts of BAD has resulted in the reef the shark dive takes place on being declared a national underwater marine park, the Shark Reef Marine Reserve. To my knowledge this is the first time a private entity managed to create a national park. Not only does the fishing village continue to receive money from the divers, which they use for educating their children, creating opportunities outside of fishing for them, but the ones who are still fishing now catch more fish outside of the reserve than they ever caught in and outside. This is clearly a win win situation, where the sharks, the divers and the fishermen all profit. So clearly, operating a shark feeding dive has benefited not only the sharks, but the reef as a whole. Shark Diver is proud to support BAD by taking a group of divers to dive with them every year. This year we are heading there in May. Since we are based out of a hotel, the dates are flexible. 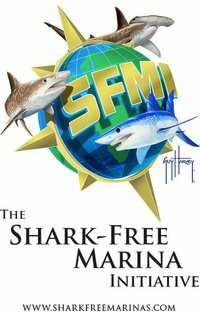 Call Cindy at 619.887.4275 or email crew@sharkdiver.com for more info. Here is a little video of what you can expect to see on your trip. Ocean Ramsey and Deep Blue? For the last couple of days, the internet has lit up with postings of Ocean Ramsey diving with Deep Blue. 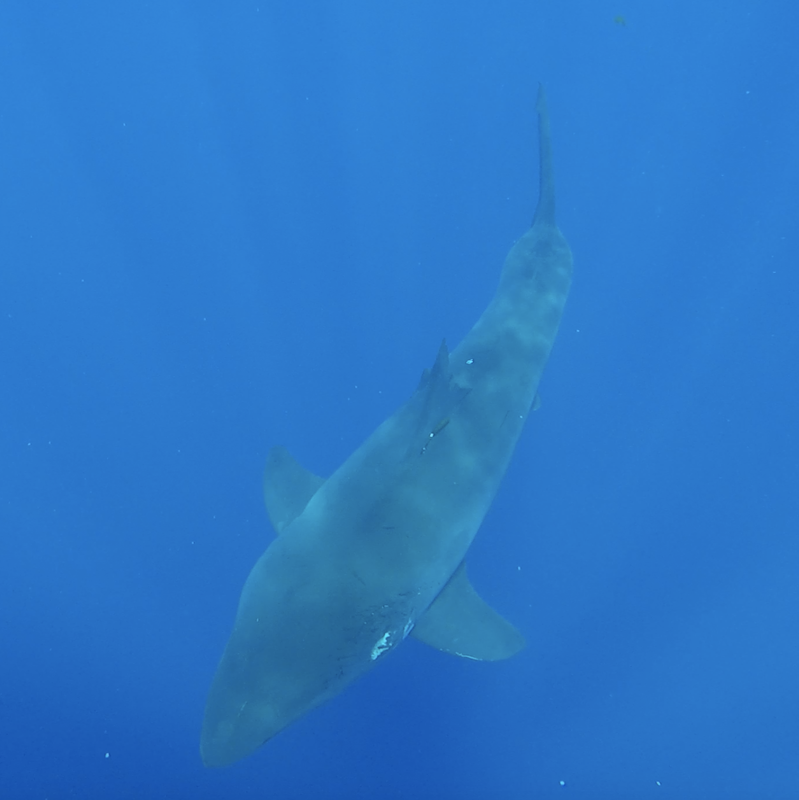 While Deep Blue was actually spotted and filmed by Mark Mohler and Kimberly Jeffries, the female Great White Shark that Ocean Ramsey was diving with was not Deep Blue, but another massive female named "Haole Girl" by the diver who first reported her. Check out her markings at the pelvic fin vs. the ID picture of Deep Blue. You can clearly see that it is not the same individual. A lot of people have commented that it really doesn't matter if it was Deep Blue or another shark. So what's the big deal? While it certainly didn't make a difference in the experience the divers had with this shark, it matters greatly when Ocean Ramsey claims to be a scientist and doing these dives for research. From a scientific perspective, it is far more interesting to know that there are other massive females out there than to "show how harmless these sharks are". The whole reason we do have a database of these sharks is so that we can have population estimates and find their migration patterns. I also find it puzzling that people portray great white sharks as either mindless killers or as harmless. They are neither! Why can't we just love them for what they are? Awesome predators, neither out to get us nor wanting to be our "friends"! I love these sharks and I'm not afraid to say, it's not a mutual feeling! 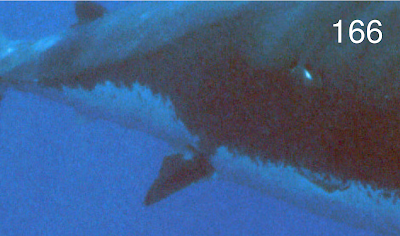 A completely different problem with the diving taking place around this shark is described by "Doc Domeier", one of the preeminent shark researchers at Guadalupe Island. 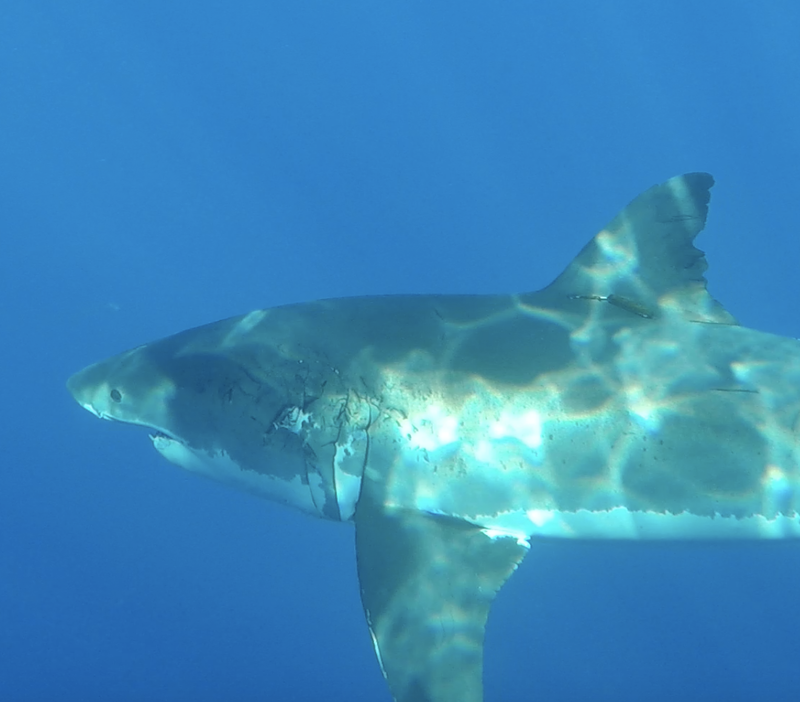 Doc, along with Nicole Lucas-Nasby are the scientist at the Marine Conservation Science Institute, the first scientists to tag and catalog the great white sharks at Guadalupe Island. I was going to let others chastise O. Ramsey for riding the white shark in Hawaii, but then I saw her post this: "I waited quietly, patiently, observing as she swam up to the dead sperm whale carcass and then slowly to me passing close enough I gently put my hand out to maintain a small space so her girth could pass." Take a look at this video and see if you feel her words are consistent with her actions. 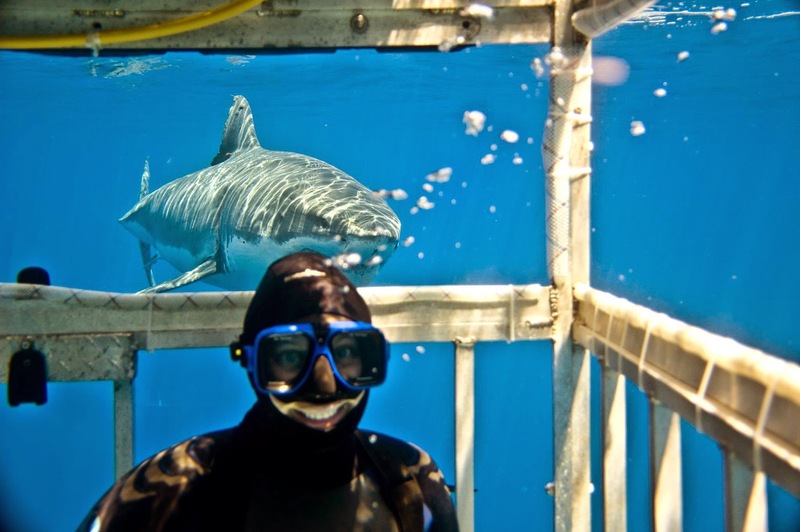 Years ago she came to social media fame by illegally riding white sharks at Guadalupe Island. Not only is it illegal in Mexico, it is unethical the world over. The number 1 rule of legitimate shark diving operators is DON'T TOUCH THE SHARKS! This is not shark advocacy...it is selfish, self-promotion. Look at all of the other people in the water hoping for a once-in-a-lifetime experience...instead they can't even take a pic of the shark. And lastly...posting selfies with white sharks is really the wrong message..these are very dangerous animals. Yes, in this case they were very satiated and unlikely to bite...but the average person should not be hopping in the water with them. Would you go on a safari and ride the lions? Remember what happened to the bear whisper in Alaska?? ?...he thought he knew them so well that he was part of their family. One day one of the bears killed him and the poor woman that was with him. And FYI, despite what she says, that’s not Deep Blue she’s harassing. It’s a newly discovered shark that has been named Haole Girl by the diver that first reported her to us. Before you claim that this is just sour grapes and he simply doesn't like Ocean Ramsey, read his reason for not approving of Ocean's behavior. I have to agree with Doc. There are far too many "researchers" who are more interested in getting media exposure than doing actual research. In their zeal to get attention they often do things that not only don't help shark conservation, but actively hurt it. I've been diving with Great White Sharks for over 20 years. We discovered the sharks at Guadalupe while SCUBA and freediving, so I know firsthand what it's like to come face to face with a great white shark and I can say that the experience is no less exciting when you are safely in a cage. Sharkdiver will never allow out of cage divers at Guadalupe Island. It is illegal and dangerous. There is no reason to go outside of a cage, other than to brag to others about having done it. That's why we call what we do "Safe and Sane" Shark Diving. 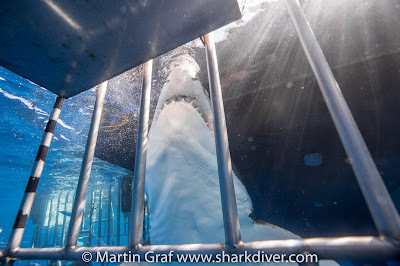 If you want to experience coming face to face with a Great White Shark, give us a call at 619.887.4275, email crew@sharkdiver.com or visit www.sharkdiver.com for more info. Labels: bad media, conservation, deep blue, great white shark, Ocean Ramsey, research, shark, shark attack, Shark diving, sharkdiver, sharks, stupid "scientist"